The ‘Synthesize’ button allows the user to quickly review the contents of their folder. Multiple syntheses can be made for each folder. 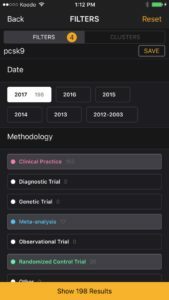 The purpose of each synthesis is for the user to narratively combine results across studies and rate how a clinical predictor is related to a clinical response variable based on their current clinical experience, the current biological/physiological mechanisms, the current expertise in the field and the current clinical trial data. 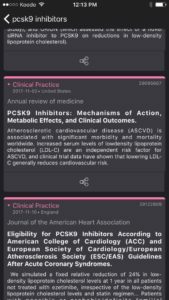 I used the query ‘pcsk9’ and got over 1500 hits. 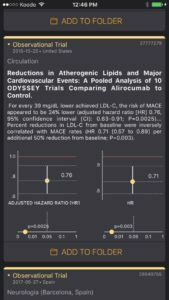 I perused some of the results and recent guidelines and noticed that indications for pcsk9 inhibitors are starting to include primary and secondary ASCVD risk. 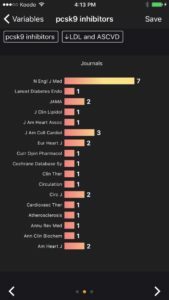 I then applied some filters to look at the most recent Clinical Practice, RCT, and Meta-Analysis cards. 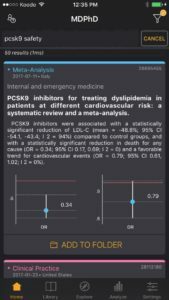 I quickly scanned and added some cards to my folder ‘PCKS9 inhibitors’. Step 2. Scan the contents of your folder. Initially I like to scan the guidelines/reviews and get some background information. 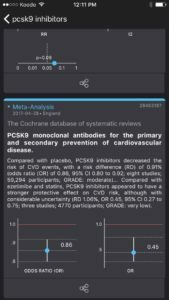 I quickly learn some of the biological basis of PCKS9 inhibitors and what the experts in the field are recommending. 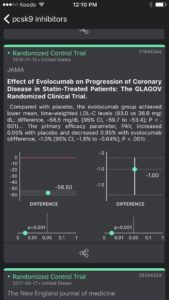 I also notice there are three PCSK9 inhibitors that are currently being used: evolucumab, alirocumab, and bococizumab. If you tap the card you can read the full abstract as well. 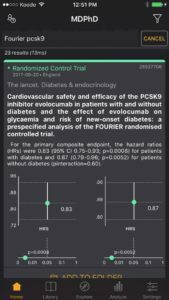 Then I like to scan the Meta-Analyses and RCTs on PCSK9 inhibitors. 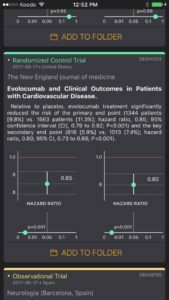 I am looking for clinically significant outcomes that are reproducible across studies in different settings. 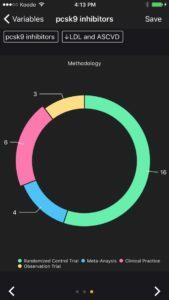 I use the data visualizations to help guide me. 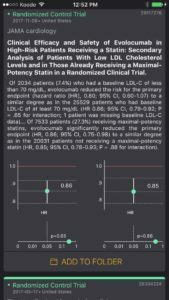 The point estimates and confidence intervals are graphed to show the magnitude and precision of the outcome. 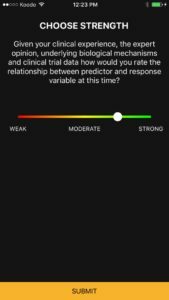 I cross reference the data visualizations with the text in the card to identify how the predictor (i.e. 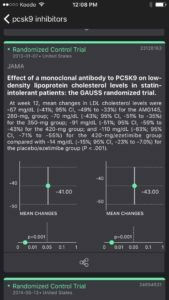 pcsk9 inhibitor) is related to the response (LDL levels, CVD risks etc). 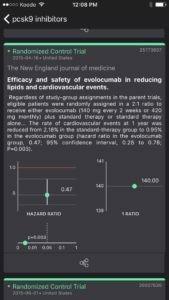 You can also compare how far the point estimate/CI is from the red baseline giving you an idea of the statistical significance and clinical significance of the results. 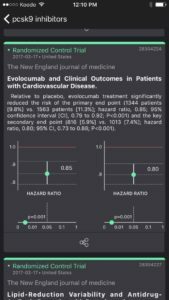 P-values in isolation rarely give you a sense of the clinical significance. 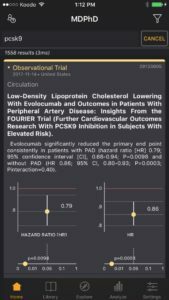 I am also interested in Observational trials which also highlight important statistical signals and insights related to my query. Step 3. 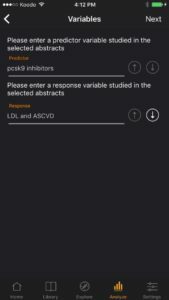 Tap the Synthesize button and add a new synthesis (plus sign) and choose your folder ‘PCSK9 inhibitors’. Select the cards that you want to synthesize. 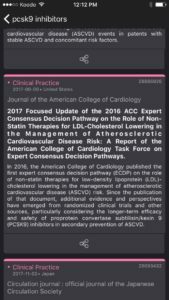 I don’t include a lot of the original studies on these drugs within the setting of familial hypercholesterolemia. 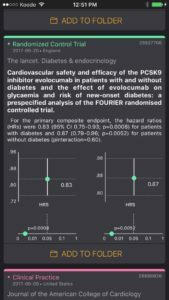 I am particularly interested in the more recent indications of PCSK9 inhibitors within the setting of primary and secondary ASCVD prevention. 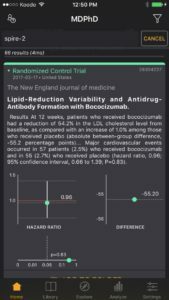 I select the relevant Guidelines, RCTs, Meta-Analyses and Observational trials. I type the predictor and response variables that are a recurrent theme in the selected cards. 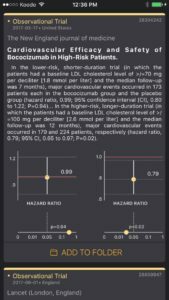 In this case, the Clinical Practice, RCTs, Meta-Analyses and Observational trials consistently show that PCSK9 inhibitors (predictor variable), decrease LDL levels and ASCVD risks (response variables). The cards that I select also have some more interactive data visualizations associated with them. For example, I can appreciate where the articles have been published, which journals the articles have been published in, and the study design of each article. 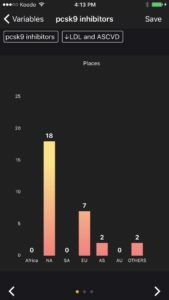 Remember the graphs are interactive so you can tap on a bar or slice. 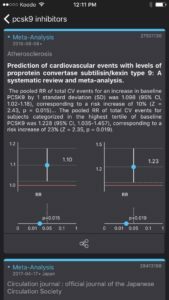 Finally I rate the strength of association of the predictor variable and response variable using my clinical experience, biological mechanisms, expertise and trial data. 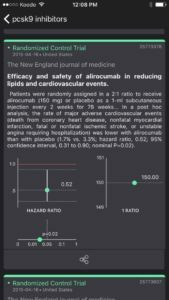 My clinical experience with the drug is limited but given the guidelines, safety profile, clinically reproducible results in multiple RCTs and Meta-Analyses, the association between PCSk9 inhibitors and secondary prevention of ASCVD seems close to strong. 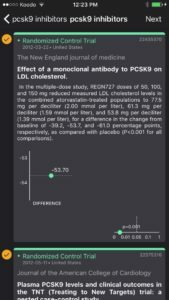 As more users in the MDPhD network synthesize their folders on PCSK9 inhibitors, a consensus opinion may be reached. 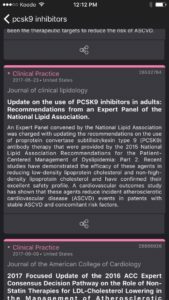 For example, I would especially be interested in folders and syntheses created by regular prescribers of PCSK9 inhibitors (i.e. cardiologists, family physicians etc). Evidence-Based-Medicine is hardly ever analysis-paralysis of a single article. Always look at the big picture. Always update your evidence periodically. Strong associations today can become weak associations tomorrow and vice versa. Finally, when making clinical decisions, as always, incorporate patient values and resources.